From left, Les Hall from the Meadow Valley Fire Department, Kelby Gardiner, Bob Beckwith, David Kinateder and Meredith Hackleman, also from the Meadow Valley Fire Department, pile-burn at David Popp’s property on La Porte Road on Dec. 21st. Plumas County’s forested beauty comes with a price: These forests burn and will continue to burn. The question is, what tools do the community have to encourage the kind of fire that can by tolerated by residents? If those tools can be used effectively, the worsening cycle of fire that destroys everything in its path can be interrupted. Around homes, there are a range of things that can be done to create defensible space.Often these activities lead to an accumulation of material that has to be dealt with. What are Plumas County residents’ options?It can be taken to a transfer station (usually at a cost), it can be chipped with the Fire Safe Council’s chipping program or it can be burned in piles. Pile burning is where the Plumas Underburn Cooperative starts to be a resource.If the property contains more piles than can be burned or if the homeowner simply doesn’t have experience with burning piles, the Plumas Underburn Cooperative is a group of volunteers who can lend a hand. But defensible space alone doesn’t have the ability to stop large, destructive fires.That’s where the issue of forest health comes in.The forest is overly dense.It is not the forest that thrived here for thousands of years prior to the introduction of fire suppression.In the roughly 100 years since, the forest floor has accumulated a thick layer of fuels from needles, cones, branches and fallen trees. Forest thinning is a useful tool to reduce density, but it doesn’t address the fuels on the ground.And thinning treatments don’t last forever — within about 10 years (the historic interval that fire used to burn on the landscape) regenerating trees and shrubs can become a hazardous issue again. The most effective tool in these cases are prescribed and managed fire. That is why the Plumas Underburn Cooperative was formed — to bring together a group of people who can support each other in the use of fire to reduce the existing fuel load and maintain that benefit over time. 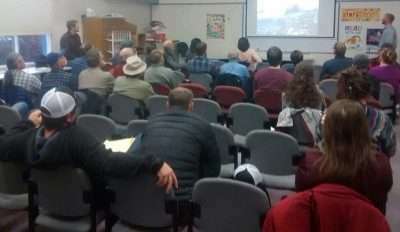 A public workshop was held at the Quincy Library on Jan. 15th. Presenter Jeff Stackhouse, the Livestock and Natural Resources advisor for the U.C. Cooperative Extension in Humboldt, presents case studies from the prescribed burn association. 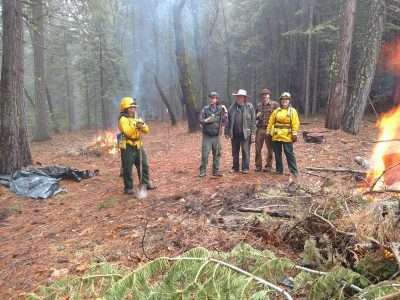 The group’s membership is varied and includes firefighters, homeowners, retired individuals who have been using prescribed fire for decades, and those who aspire to gain basic skills.Participants are volunteers acting as citizens, regardless of what qualifications they have in their day job, or as partners from supporting agencies like CalFire and Plumas National Forest. The goal is to share skills, tools and knowledge to safely burn forested areas.The primary outcome is fuels reduction, but there are also members interested in using fire for other benefits, including meadow and native plant restoration. The Plumas Underburn Cooperative has a goal of financially supporting an ongoing coordinator, Brad Graevs, who is the district manager for the Feather River Resource Conservation District. Graevs has applied for a CalFire California Climate Investment grant to provide seed funds to cover expenses like tools and training. The Plumas Underburn Cooperative is holding a Dutch oven cook-off fundraiser, from noon to 2 p.m., Sunday, March 24, at the Meadow Valley Fire Station, 6913 Bucks Lake Road. The event features live music, beer on tap and taste testing of grub cooked over coals from fuels reduction in action and provides and an opportunity to learn more about prescribed fire, other fire safe resources, and to join the Underburn Co-op. For an entry form for the cook-off visit the website listed or call Hannah at 927-5281. The next Plumas County Fire Safe Council meeting is Thursday, March 14, at 9 a.m. in the Planning Department Building at 555 Main St, in Quincy. 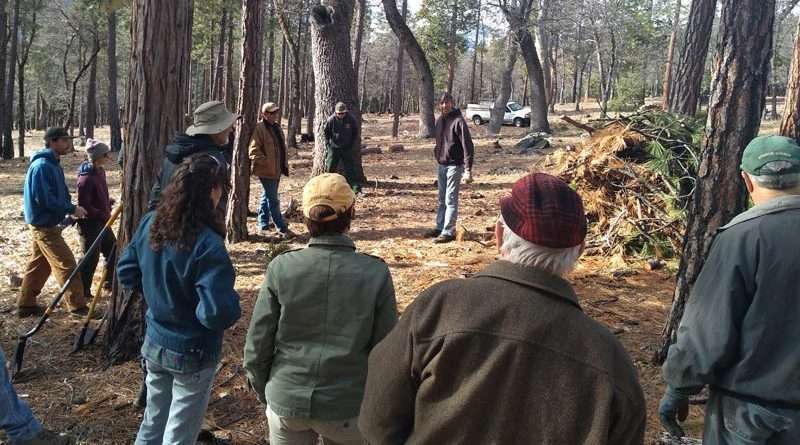 The group at Bob Beckwith’s property is finished constructing and lighting the piles of forest waste.